Whoa! 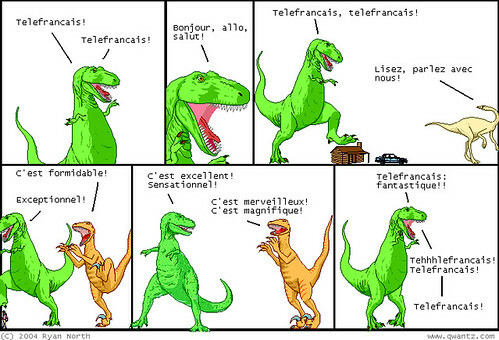 Anyone remember Telefrancais? It was that horrible 10 minute show that all Canadian kids were forced to watch in french classes. Well I just came across the theme song here and it brought back all sorts of weird and wonderful memories. It even has its own YTMND. Then I came across a whole bunch of other Canadian show theme songs! There are old classics like Sesame Street and Today's Special, but also shows I totally forgot about until today, like The Green Forest and The Edison Twins. Oh and also be sure to listen to Simon in the Land of Chalk Drawings. Obvioulsy Mike Myers watched a lot of crappy Canadian TV too. Oh wow. I don't know where you found out about that comic, but it's pure genius. Almost as much as a talking pineapple. i like telefrancais i wont to but the movies but i dont know where to buy them and it makes me so salmony mad! Wow, that was like a punch to the face from the 80's. I think hearing the themes to Jeremy The Bear, Green Forest and Dear Aunt Agnes was shocking given I don't think I ever anticipated ever hearing those again. Awesome! Kk i totally still have to watch those in french class at my school!. that crazy telefrancais song gets stuck in your head for the rest of they day! You still watch those? Awesome! I guess nothing has surpassed its genius in the 10 years since I was in French class. 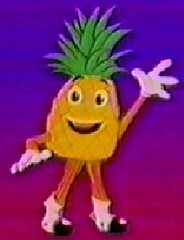 I had to watch l'ananas in French class (in Massachusetts). In college, I was a waiter and would rush home after my shift to catch the 12:30 AM episode. Definitely a guilty pleasure. -the nous sommes les etoiless..
& of course the theme song!